A HUGE squid found off the coast of Antarctica is basically the same as a normal squid, only much, much bigger, a team of disappointed zoologists said last night. It’s got a really big eye, so what? Professor Wayne Hayes, of the Institute for Studies, said they first encountered the enormous specimen while watching the second round of the World Snooker Championships from Sheffield. 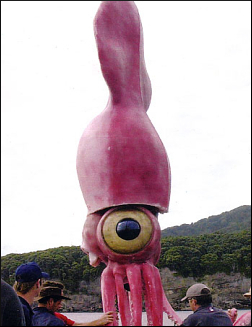 “I says to Dave, ‘Dave, d’you wanna switch off the telly for five minutes and maybe give me a hand with the world’s biggest squid that’s just been dumped in my lap, as per usual’. “I tell you what, I’m getting pretty bloody sick of this. Every time someone finds something huge and disgusting in the sea it somehow finds it’s way to my office with a post-it note on it. Dr David Hobbs said: “Anyway, I go and get my big squid book while Wayne gets stuck in with his Stanley knife and a pair of pliers. “I was thinking, ‘I bet it’s got green blood or its face is inside out. Or it’s got eyes on the end of its tentacles. Or maybe it fell out of space ship! I have to admit, I was getting quite excited. AUSTRIA'S chancellor has vowed to restore the country's international image with a £40 million 'Birthplace of Hitler' marketing campaign. Alfred Gusenbauer said the promotional blitz would stress there was far more to Austria than simply locking people in a cellar. Herr Gusenbauer said: "All the really big Nazis were Austrian, you know. "Hitler was one of ours. Very famous. The whole war thing, the genocide, that’s him. 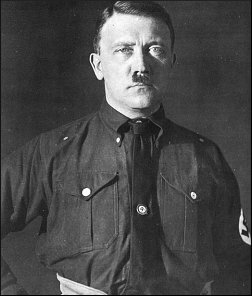 He was evil, yes, but you knew where you stood with Hitler. Nothing hidden. It’s all in Mein Kampf. "Yes, he was fond of his niece, but he didn’t lock her up or anything. In fact he gave her a key to his apartment so she could come and go as she pleased. That's got to count for something." He added: "We had thought about a Mozart campaign but nobody listens to classical music these days. It's all Duran Duran and 99 Red Balloons." Carl Schurz, an advertising executive in Vienna, said the campaign should stress Hitler's love of the Alps. He said: "The camera pans down to find Hitler running through an Alpine meadow, with his arms outstreched. "He stops, spins around and then bursts into song. The sun is out, there's mountains, sky, wide open spaces, no cellars. It's nice."